Version 1.7 “Dangerous Pudding” Now Live! – Added VAC support for multiplayer. VAC banned users will only be able to play with each other. A new tab called “Avatar” has been added under Player Info. It allows player to choose any of their unlocked characters and customize them with color options they have unlocked. This avatar is used in all their menus, and on the multiplayer lobby screen. 4 new hair colors have been added for each regular character (not the unlockable NPC/boss characters). One of them can be unlocked for each by playing 10 multiplayer games with said character. 3 others can be acquired as drops from multiplayer games. A deck wheel with 3 numbers and a save button has been added on the deck screen. To use it, create the deck you want and press “S”, then any of the three slots to save the deck. 3 different decks can be saved for each character to allow for maximum customization and fine tuning. Create your ultimate decks! Campaign screen now has an option to choose from 3 difficulty levels: Casual, Normal and Extreme. Each episode is marked with a different colored crown to signify the difficulty with which you have cleared it (Green – Casual, Red – Normal, Purple – Extreme). Clearing a map again at a higher difficulty upgrades your clear level. *Normal is the original campaign difficulty setting. *Casual difficulty gives all CPU characters regular rolls, considerably lowering the difficulty. Note: does not unlock campaign Achievements. *Extreme difficulty is for those seeking the ultimate challenge. Prepare to lose your sanity as Poppo hammers you to the ground. Doesn’t give any special reward, though. Field events for each map can now be freely changed in Free Play. Added Random option for field events in Free Play: this will random any non-duplicate field event (or possibly ‘no event’, if Poppo steals it). -Voice C volume has been raised to bring it on the same level with other voices. – Menu performance has been optimized, resulting in shorter loading times when moving between menus. The game may initially load slightly longer. – Renamed Schiff Robot to Shifu Robot. – All Trap Cards now have 0 cost, allowing for more flexible play with them and removing the issue of experienced players being able to tell from the card’s cost what each trap is when it is played. 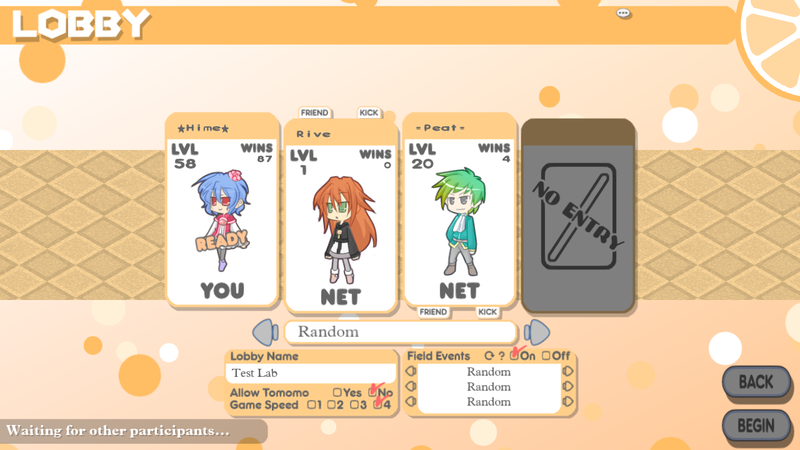 ← 100% Orange Juice Fan Art Contest Winners Announced!